Jack Nicklaus: "I watched The Squeeze and really enjoyed it. It's a fun movie that tells an interesting story, and the golf elements are so real you actually believe it could happen." Phil Mickelson: "The Squeeze is a wonderful golf movie because it's so authentic. It hooks you in the beginning and stays interesting and entertaining right to the end. I'm looking forward to seeing it again." Whether the movie-reviewing skills of Nicklaus and Mickelson are anything close to their golf skills remains to be seen. But the simple fact they are willing to attach their names to this project is a major coup for an independent movie like this. How did Nicklaus and Mickelson get involved in "blurbing" The Squeeze? Through its writer and director, Terry Jastrow. Jastrow's name is very well-known in the field of sports programming; he's a 17-time Emmy nominee and 7-time Emmy winner over his 24 years as a director and producer at ABC Sports. There he produced or directed 68 major championships, not to mention a few little other things called the The Super Bowl, The Indy 500 and The Kentucky Derby. His credits as producer also include a season of Shell's Wonderful World of Golf and a 2000 TV movie called Killer Golf. Less well-known is the fact that Jastrow was a top-notch competitive golfer as a junior and collegian. He won the 1966 Texas State Junior Golf Championship and played collegiately on the powerhouse University of Houston golf team. He is a member of the Texas Golf Hall of Fame. Jastrow is among several listed producers of The Squeeze, too, along with his wife, the actress Anne Archer. 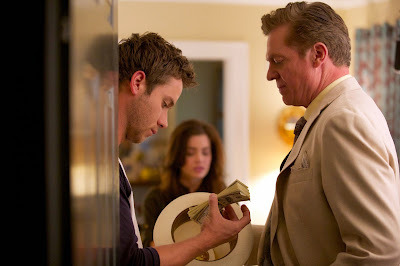 The Squeeze is a caper about a notorious gambler who discovers a modest young man in a small rural town with uncommon golf skills. Seeing his potential, the gambler convinces him to abandon his dreams of winning the US Open and start playing in high-stakes matches. They don't lose. The stakes grow higher and higher until the game becomes "life or death." The Squeeze will debut on premium video-on-demand and in theaters in 12 top markets on April 17, 2015.